With New York City under curfew and the National Guard moving in to try and quell the unrest, gang violence and looting begins to break out. H.A.A.R.M. members seem to be at the epicenter of the worst of it, even going so far as to bomb power substations in addition to looting shops. Mikey gets a call from Klag to meet him in Union Square and leaves the lair (against Leo’s orders). Klag picks him up on his hovercraft and tells him that he’s been researching H.A.A.R.M. and has found out where their headquarters is (Oberon Bros. Garage) and who their leader is (a guy named Jingo). Klag wants to try and talk things out with Jingo but asks Mike to come with him in case things get violent. Things get violent as soon as they approach the garage and while Mikey and Klag fight off the thugs, Jingo flees. At the same time, weird energy rings appear above the city. Ambassador Cesse Mon Zir Te comes on TV to tell the public that the rings were an atmospheric after-effect of a scan for weapons of mass destruction. He explains that the scan was performed with the cooperation and approval of the US Government and the energies that were used would cause no harm to anybody. Nevertheless, this puts people on edge. The news then picks up a story about a strange object appearing in Central Park. The NYPD evacuates and cordons off the park until the situation can be examined. After dark, Mikey sneaks into the park to get a look at the weird monolith. He imagines that it might be a giant box containing a killer robot, but snaps out of his daydream when he notices a signature at the bottom of the monolith. Mikey hears voices and flees to the trees. Jingo and a mob of H.A.A.R.M. thugs come storming in with a small alien in tow. 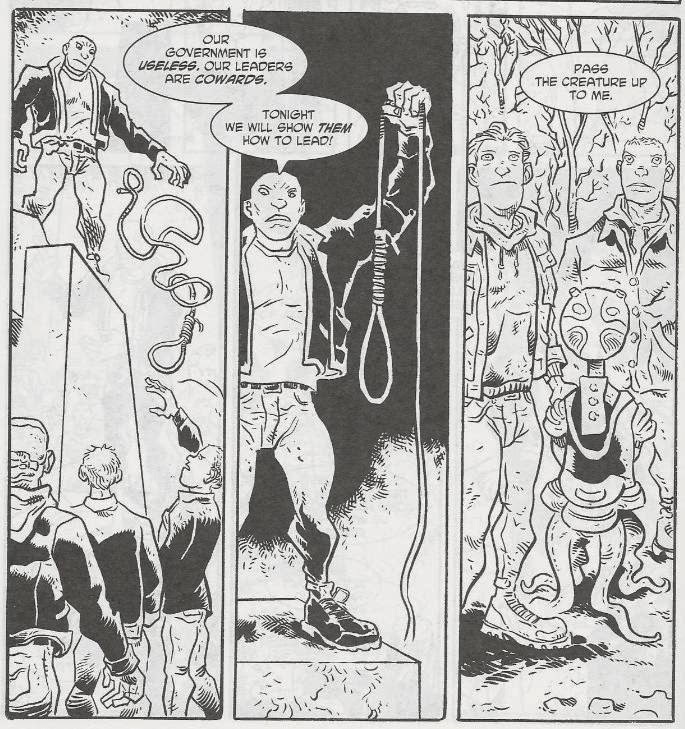 Jingo gives a speech about taking back America from their cowardly government and suggests they start by lynching the alien on his own monolith. Mikey drops down from the trees and protects the alien from the thugs. Suddenly, Detective Clover appears from the bushes, flashes her badge and all the H.A.A.R.M. thugs (and the little alien) scamper off. Clover tells Mikey that the monolith was a piece of modern art stolen from a recent exhibit. Jingo and his H.A.A.R.M. lackeys put it in Central Park to stir up trouble and unrest. Clover then tells Mikey that he’s still wanted for being an unregistered “alien” and pulls out a pair of handcuffs. Mikey immediately vanishes into the night. *This story is continued from Michelangelo: The Third Kind #2. 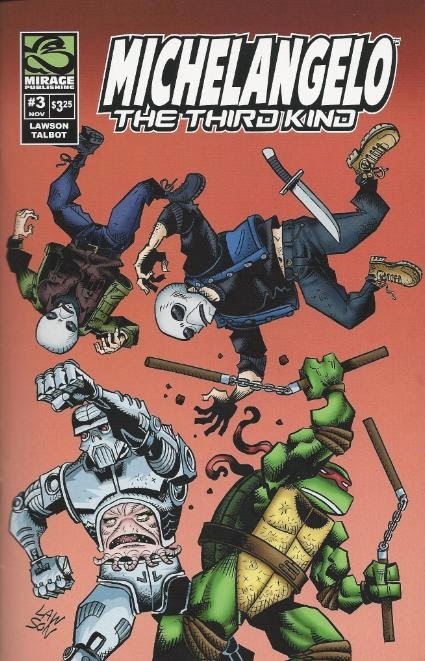 The story continues in Michelangelo: The Third Kind #4. Well, the most exciting part of this issue turned out to be a daydream sequence (the giant robot), so we’re still in dullsville with “The Third Kind”. There are a lot of interesting ideas floating around in here, like the City being under lockdown with xenophobic gangs rioting and blowing up buildings and the citizenry panicking as aliens scan the skies… But damn if Lawson isn’t sapping all the life out of it. I know he’s going for a really grounded look at the whole scenario, but it’s hard to believe such a tumultuous period in the TMNT timeline can yield such a tiresome yarn. And most of the metaphor and subtext is pretty on-the-nose, particularly in regards to the character Jingo. So we have a guy with a name that invokes the term “jingoism” giving long-winded anti-government speeches about taking back America from the bureaucratic fatcats in Washington. And I think he’s a black guy maybe (hard to tell with his model fluctuating in every panel), so the scene where he tries to rally a mob to lynch an innocent alien is supposed to be, like, cruel irony or something. Yeah, real deep, man. I guess if one good thing came from this chapter, it’s that Mikey’s screw-up at Pier 41 is finally catching up with him. I complained last issue that Mikey shouldn’t have been thanked for causing a huge publicity crisis for the aliens and here he’s actually being invited to suffer the legal consequences for his behavior. He bails, of course. Ah well, we’re nearly at the finish line for this thing.